Crucial Question: When is a customer an inconvenience? – QBQ! Crucial Question: When is a customer an inconvenience? Though I was driving farm tractors and pick-up trucks by age 13, not to mention replacing my 1970 Plymouth Valiant’s water pump and radiator at 20, I’ve never felt super comfortable in auto parts stores. I’m probably not alone. If there is ever a time to help me feel welcome, it’s in an auto parts store. Ah, a person whose face would light up a room if he left. Got it. When I showed him the old battery, he led me to an expansive wall of batteries of all sizes, colors, and brands. Then the STORE MANAGER turned his back on me and walked away. I was stunned. Really. I can’t think of any customer service training program that would teach a person to ever turn their back on a customer and walk away prior to the customer feeling his problem was resolved. Yep, I really did say that. Question: When is a customer an inconvenience? This guy is the manager??? Wonder how I might reach their District Manager. An hour later, I was on the phone sharing my experience with the Auto Zone district manager. He handled it well. Outstandingly, in fact. I was impressed. The next day, though, I needed more auto stuff so I voted with my Tacoma and drove an extra eight miles to shop O’ Reilly’s, NAPA, and Advance Auto Parts. You see, like almost every customer in the world—I. Have. Options. Do you agree that customers see an organization through the person they’re interacting with at that moment? In what situation have you seen someone blame the customer? Is it “all about the customer” in your organization? Share a thought or two below! Where Does Customer Service End and Consumer Entitlement Begin? 4 Customer Service Lessons From … An Airline?! Winning and Losing Customers Is … a Choice! Wow this happens to me quite often and there have been times when I leave without a purchase or leave with a purchase and call the store manager. Grant it their our customers that are not always pleasant and in those instances you really want to let them have it and not care if they make a purchase. 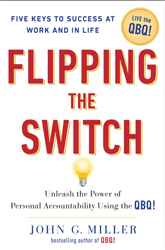 This is a challenge but I agree a lot of organizations need the QBQ thanks for sharing I have made the QBQ part of my personal vision trying not to blame but focus on how I can resolve the issue. Felicia, appreciate your commitment to living that QBQ! At one time I was a District Manager for a competing Auto Parts Compnay. It is definitely a culture that can be and needs to be fixed. Auto parts is a highly competitive business and the only differentiator is service. I know at one time when we worked hard to instill a QBQ culture we showed sales increases of 10% and more based on service alone. Customers are never an inconvenience at any level. Welcome, Tom … thanks for stopping by! Our organisation has had it’s share of blunders, it seems sometimes people make mistakes! But what our customers tend to remember is the great customer service they receive from us. Without the customer, we’re out of business, and we like to be in business. David, love that line: “and we like to be in business.” Ha! Thanks! Build an organization based on the character of the people and it will succeed. In my opinion Customer Service is really psychological. When I’m training my associates, we have robust discussions around that… As I interact with the customer their brains start doing some amazing things based on how I make them feel. It’s important that I understand how I affect the person on the other end of the phone. We also have a similar discussion about when the client calls in, they are calling our company, so as far as the clients are concerned, I am the company! They remember those interactions and how I made them feel, which in the end impacts my companies reputation. One of my all time favorite quotes ties into that, “I’ve learned that people will forget what you said, people will forget what you did, but people will never forget how you made them feel.” Maya Angelou So if I make the client feel unimportant, that’s what they’ll remember… if I make them feel stupid, that’s what they’ll remember… If I went out of my way to treat them like a human being and go above and beyond what they were looking or asking for, that’s what they’ll remember. So in the end, it really doesn’t matter if the client is right or wrong (because they’re not always right 🙂 ), it’s all about how I made the client feel while I interacted with them. Research has proven that this is even more important than getting the issue resolved. So to your question, “When is a customer an inconvenience?” My answer is emphatically, NEVER! There’s always a learning opportunity in every customer interaction. I could be learning about the customer, their concerns or struggles and how I can support them or the customer could be learning about my company. I just need to choose to have a great attitude and be there for the client. Then they won’t shop elsewhere because they’re getting everything they need from me. Phil, love the philosophy you shared! I agree. Regardless of what we think, the customer thinks “we” are the company regardless of roles or titles. I had a “District” manager recently say “I am tired of looking stupid in front of the customer”, and then continued to let us managers know it was our fault for not communicating effectively with updates and information. Ideally, as managers or customer representatives, we would know everything. But we don’t. Nor do we control everything. Continued experience prepares, but there will always be times when we are caught off guard. The best remedy, figure out how to handle and expect to deal with uncomfortable situations – Welcome to Customer support! Regardless what people think, our job is to look stupid, feel awkward, and answer to the best of our abilities any questions or concerns and come up with a solution to make the customer happy – with an attentive smile. Took my lovely wife out for a birthday dinner. We picked a restaurant we hadn’t been to in years. After ordering, we waited and waited and waited. The waitress told us, “Sorry there is a big party.” Finally, our dinner came out, and we enjoyed our meal. We sat in front of our empty dishes for another 10-15 minutes before she noticed we were done. “Can I get you anything else?” My wife answered we’ve been here almost 2hrs. We don’t get out much, and this was my birthday dinner.” “Yes, we had a big party.” came the reply. Then silence. “Ok, I’ll get your check.” I looked at my wife and said, “She could have made all of our frustrations disappear by saying, “Listen I know you’ve had to wait a long time, and I’m sorry. Can I get you both a cup of coffee (which they were probably going to throw out anyway since we were one of the last patrons there) and I’d love to get you both a piece of cake on the house.” But instead, she delivered our check, and I made my thoughts known by our tip, and we decided, since we have options, next time we’ll go elsewhere. As we say… it’s always the little things that make the big difference. Though we are not related, Mr. Miller, we agree on this: I. Just. Don’t. Get. It!!! It’s so easy, yet people make service so complicated. Was that the Chrysler Plymouth slant 6 engine that you worked on? If so, that was a real pleasure to work on. You could change the starter without getting under the car ! Lots of arm room then ! Nowadays you have to take multiple things off to get at the bloody failed part ! It is a shame you, as a customer, were treated that way. They should have checked the battery for the correct capacity, size and CCA(cold cranking amps) and then directed you to the right one. Customer is King! Who is providing their livelihood? I can relate a direct opposite experience showing what customer service is. I had to replace an all in one strut/spring cartridge for the suspension on one of my cars. I visited the Advance Auto Parts website and up popped a coupon for 25% off. Wow, I thought. Let me go to the store and pick this up. It happened to be a Friday afternoon and with my SmartPhone I figured I order the part online and get my discount and then pickup the item. I went to the store and they were out of the item. Rats ! The manager asked me when I needed it and I told him I was doing the job this weekend. He asked if I could come back in 2 hours as he would a staff member run to another Advance Auto Parts location some 15 to 20 miles away (one way) and he would have the part for me in a couple of hours. I asked him if I needed to pay first and he politely asked me if I wanted to ? I returned about 1.5 hours later and was pleasantly surprised my part was there waiting for me. This manager knows what customer service is all about. It is no wonder why Advance Auto has flourished and expanded in the marketplace. I’m in a little different situation, proprietary post secondary education. So my students are my customers, what I like to tell my faculty members is that we “live” with our customers for about 9 months, 6 hours a day, 4 days a week. Talk about customers in your face! It is a bit tricky because although they are customers first, they are buying an education so we have a responsibility to be sure we deliver the material. 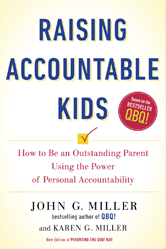 The trick comes in when some students actually think we should “give” them grades that they do not earn or if we have to remove a student from school due to lack of satisfactory academic success or disciplinary reasons. I think so of what John is talking about is not just customer service but really common courtesy. Christine, excellent points! “In you face” – funny! If you hear questions like these in your organization, we can help! “Who’s going to solve the problem?" 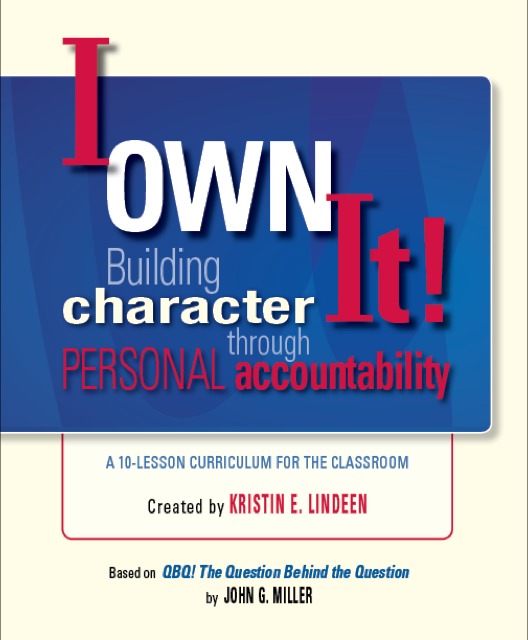 Receive our Personal Accountability message by email! What are QuickNotes? 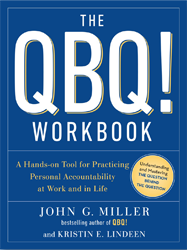 Read the QBQ! book? What did you like about it? 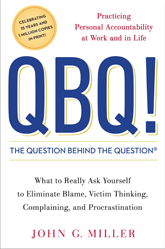 WHY DOES QBQ, INC. EXIST? Want faster change? 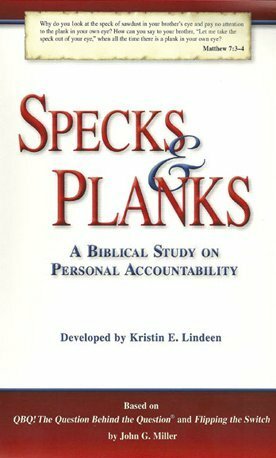 Accountability, ownership, and responsibility as cultural values? Then bring QBQ! 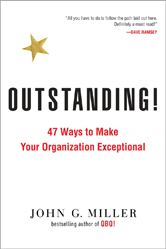 into your organization today! INTEGRITY Begins With … ?? ?